If you have an Android phone with an NFC chip, Andrea Fontana's free app will let you see how many rides are left (or how much time remains) on your ACTV vaporetto and bus tickets. 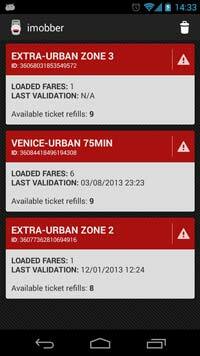 ABOVE: These Imobber screen captures show the fares stored on various ACTV tickets. Like many transit systems, ACTV--Venice's boat and bus network--has switched from traditional paper tickets to stored-value cards that can hold fares for multiple trips. And while this is convenient in some ways, it does make it harder to keep track of how many rides you have left and when the fare for your current ride expires. The green ticket readers at larger ACTV stops are safer to use, since they don't validate tickets--they merely show the stored fares. You can also use the app to check how much time is left on your 12-hour to 7-day ACTV Tourist Travel Card. "If you have a bus ticket or two or three, you can test them only when you're inside the bus. There's no machine at the bus stop to check them. And if you're inside the bus, it could be too late to discover that your ticket is empty! Some people attach Post-It notes to their tickets to remember the fare types and how many rides are left." 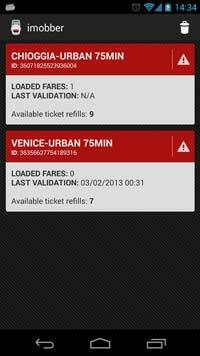 To install the free Imobber app, go to the Imobber - Venice Ticket Reader page at the Google Play store. Screen captures © Andrea Fontana.